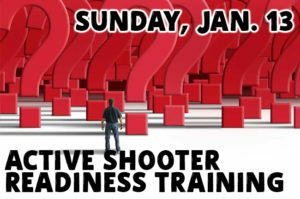 Sunday, Jan 13, 3-5:30 PM, our congregation is invited to an Active Shooter Readiness training, provided by the Linn County Sheriff’s office. Training will enhance our safety and assist in helping others in our community with any incident involving a violent attack. Invite others in the community to join you. RSVP on the bulletin tear-off Sunday mornings or contact the office if you plan to attend.